The UGSAS will confer Ph.D. (Agriculture) degrees on students who have acquired the research capabilities and in-depth knowledge required to engage in independent research activities or highly professional tasks as researchers in agriculture and related fields. Below are the degree requirements in each major Course. Students are required to demonstrate that they have acquired the research capabilities, in-depth knowledge, and advanced skills required to improve or resolve various issues related to the areas of production, distribution, and consumption in the agriculture and forestry industries. Students are required to demonstrate that they have acquired the research capabilities, in-depth knowledge, and advanced skills required to improve or solve the various issues that arise in the production and surrounding environments of the agriculture, forestry, and fishing industries. Students are required to demonstrate that they have acquired the research capabilities, in-depth knowledge, and advanced skills in the areas related to the elucidation of the biological functions of diverse species, such as animals, plants, and fungi, as well as their advanced use. Students are required to demonstrate that they have acquired the research capabilities, in-depth knowledge, and advanced skills required to improve or solve various issues related to the environment and food in arid regions around the world. Every student is basically required to study for at least 2 years and to earn 12 academic credits before to submitting a doctoral thesis to the school. One must pass the examination of the doctoral thesis and the final academic ability test by the Examination Committee. 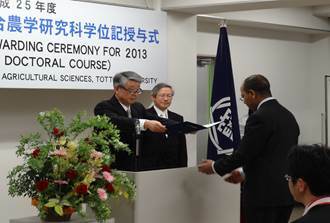 Students will be conferred the Doctoral Degree (Agricultural Sciences) by Tottori University when the above requirements are completed. 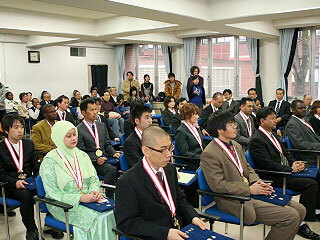 Tottori University can confer a Doctoral Degree to those whose academic achievements are equal to or higher than the course doctoral students, and who submit a doctoral dissertation and pass the subsequent examination.